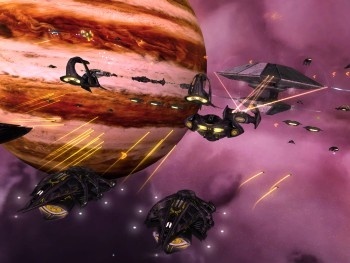 'Tis the season for boycotts and the latest combatant to enter the arena is none other than Sins of a Solar Empire publisher Stardock and its CEO Brad Wardell, who are boycotting shipping company UPS over its boycott of Fox News. It's a complicated story to try to keep up. A few weeks ago, UPS announced that it was pulling its advertising from Fox News because it could no longer tolerate the opinions expressed on the Glenn Beck show. The final straw apparently came when Beck, a conservative radio and television talk show host notorious for his inflammatory statements, said U.S. President Barack Obama is a racist "with a deep-seated hatred for white people." The decision to pull its advertising from Fox News as a whole didn't sit too well with Wardell, who said Stardock does a "non-trivial amount of shipping with UPS" and that if the report of the boycott was true, he'd switch the company to FedEx instead. It was true, Stardock switched couriers and that was that; except, as we should all know by now, that is never just that. A lot of people understandably took Wardell's decision to drop UPS as support for Beck and his political views, which didn't sit too well with Wardell either and prompted him to issue a statement clarifying that his reasons for boycotting UPS have nothing at to do with Beck himself. "My Facebook comment was taken considerably out of context. I could care less about Glenn Beck or whether someone advertises on their show or not," he said. "But UPS is boycotting the entire channel which annoyed me enough to ask my publishing director to look into whether it was true (it was) and have them look into Fed Ex which provided competitive pricing and make use of them for our uses." "Frankly, I wouldn't have cared if UPS had pulled their ads from Fox if they had done so quietly. But they didn't. They had to 'take a stance'," he explained further on his personal blog at JoeUser.com. "I'm not a huge fan of FOX. But as a conservative, it is nice that there's one station where my values aren't ridiculed. I don't have some 'thing' for Fox. But Fox makes an easy target and it irritated me to see UPS playing such games." I wonder if he'll get a free trip to UPS headquarters out of this?